Membership of the MCC Real Tennis Section only cost $35 per annum and you do not need to be a member of the MCC Club itself in order to join us as a sporting section member. 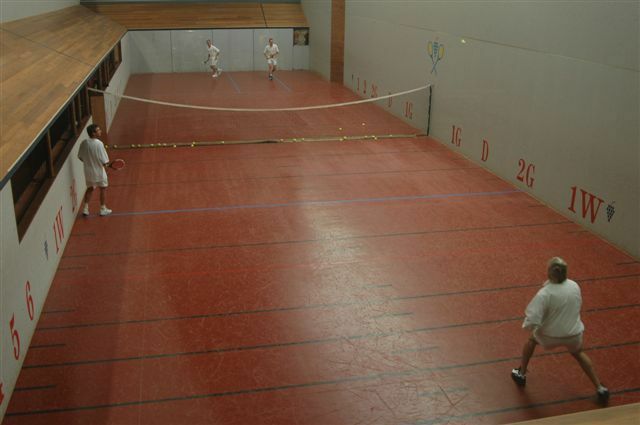 Membership provides access to both beginners and experienced players to some great Real Tennis playing opportunities across Australia and beyond as well as supporting the growth and awareness of the sport at large. New MCCRTS members receive two hours of free tennis lessons with a Professional as an incentive to take up the game and to get you started. Paticipation in Member & Introduction Nights designed for new players to be on court with a Professional to learn the basics. These are friendly events held on the second Friday of each month played at the Royal Melbourne Tennis Club's courts in Richmond, followed by drinks & dinner. Participation in Inter-Club pennant matches (normally handicapped doubles), normally held on a Sunday or over a weekend against Melbourne, Hobart, Ballarat & Sydney both home and away. Participation in the Handicap Club Championship tournament open to all members and held throughout the year in a knock-out format. MCC teams in international tournaments such as the Boomerang Cup. Participation in the Cowper-Cowdrey Cup played between the Melbourne and Marylebone Cricket Clubs in Melbourne or at Lord's accordingly during each Ashes series. Access to functions and invitations to other MCC Sporting Sections activities, including football matches at the 'G' in the Hans Ebling function room. Access to events hosted by other MCC Sporting Sections (e.g. Squash, Hockey, Golf, etc). The Sporting Sections Grand Final Week Lunch with prominent guest speakers from the footy world, held in the MCC Member's Dining Room at the 'G' on the Monday prior to the the AFL Grand Final. Sporting Sections Grand Final Day Lunch (Full MCC Members Only). Refer to the attached Brochure for further details. Download the MCCRTS Membership Form here and become part of a growing section.